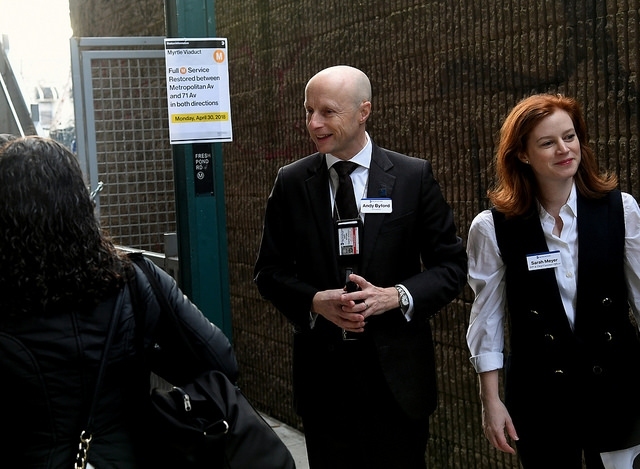 "Regardless of what the intent was," Byford said, referring to Manhattan District Attorney's announcement to shy away from criminally prosecuting fare-evasion, "I think people heard that there would be less of a penalty and that that has led to more fare evasion." 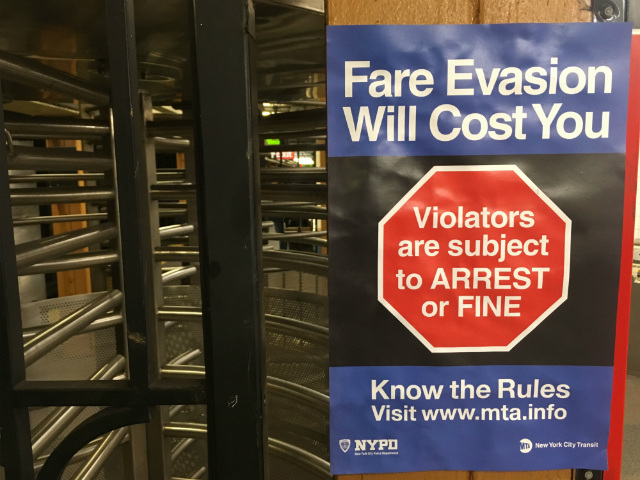 The issue of fare-beating has become controversial in recent years as activists (myself included) have opposed police enforcement of fare-evasion as one of the principal drivers of Broken Windows policing, which overwhelmingly targets Black and Latino New Yorkers. Byford echoed New York City Mayor Bill de Blasio, one of staunchest defenders of the Broken Windows theory of policing, which advocates for aggressive enforcement against quality-of-life offenses (like fare-beating), when asked if his proposed crackdowns would target transit riders too poor to pay the fare. The Mayor, who also criticized the Manhattan DA's policy shift, has been condemned for repeatedly suggesting that fare-beating wasn't an issue of poverty since fare-evaders were caught with "money on them.” Byford made the same argument Monday. To stop farebeaters, Byford is now suggesting he can build a fortress of MTA executives and police officers to create "a physical block" at turnstiles in a Braveheart-like standoff over precious transportation revenue. The first few problems with Byford's arguments here—and there are plenty—are the assumptions made about people's economic situations. Putting aside the fact that neither the Mayor nor Byford have evidence, aside from anecdotes from the NYPD, about fare-evaders’ ability to pay, the Brit, like the Mayor, doesn't seem to understand that you can have cash on your person and still be living in poverty. Having, say, $50 in cash in your wallet after cashing a paycheck from a minimum wage job doesn't mean you can afford the ridiculous cost of city living plus the rising MTA fare. Maybe those $50 dollars are all you have. Byford, who takes home $325,000 a year, misses this by apparently assuming only someone with lint in their pocket can be poor. Perhaps it would be best that those who are truly poor wear potato sacks so Byford is convinced? In fact, as I've written before, these presumptions about farebeaters seem to parallel conservative trolling about who the deserving poor actually are, like when the right-wing Heritage Foundation questioned if people can be poor if they have air conditioners and cable television. But would the potential fare-beaters who Byford plans to block from entering the transit system actually be willing (or able) to turn around and buy a MetroCard—or would they go to another station or perhaps even choose to walk to their destination instead? Does the money Byford seek actually exist, or is it more likely that people are actually broke and struggling in a city with deepening income inequality and rising homelessness? What's especially confounding about Byford's battlecry against farebeaters this week is that he didn't even wait for the Fair Fares program to go into effect. Earlier this year the city agreed to fund half-price MetroCards for low-income residents. The program, only funded for six months, doesn't roll out until January 2019 but could reduce the need for some people to jump a turnstile. The MTA couldn't wait three months to see what effect it could have? Although he has enjoyed relative admiration from elected officials and reporters who revere him as a thoughtful, data-driven transit savior, at last month's MTA board meeting, Byford boasted about personally scolding a fare-evader in the subway, which was reminiscent of former NYPD commissioner, Broken Windows godfather and all around tough guy Bill Bratton, who also relished tossing people from the subways. Hopping a turnstile has always carried risk of arrest, summons or worse for the untold number of New Yorkers of color who've long been targets of police. Byford's plan to get tough with fare-beaters isn't new, it's what New York City has always done. We don't need an imported technocrat to keep doing that. So if Byford's plan is more of the same, will the results be any different? For the decades that the city has tried to deter fare-evasion with mass arrests and fines, people are still hopping turnstiles in 2018 like they were in 1988. Enforcement doesn't work. Subsidizing MetroCards, #SwipeItForward and even whispers of free public transportation for residents (the same way other public services are provided) are much closer to the answers because they deal with the fundamental economic reasons most people beat fares. Someone should explain this to Byford. His stunt (and that's what it is) to have MTA executives, who make exorbitant salaries, blocking poor people from using "public" transportation will be a visual of social injustice that New York City will not soon forget. Josmar Trujillo is a writer, trainer and organizer based in Spanish Harlem.